...and whatever else your imagination may require. - Drop-off service to any location in the metropolitan area. - International event services...We have done events in Mexico, Canada, France and Germany. - We speak fluent Spanish and French. - Our staff is able to do Butler and French service. 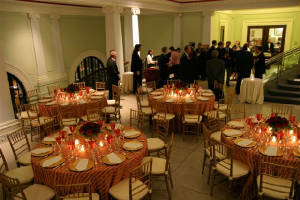 - We can provide cocktail receptions, seated events, buffet events for 2 to 2000 guests. - As we often work in secure facilities we can provide security approved servers and staff for Government , stores and private individuals events. "Throughout our lives some of our most vivid memories are associated with food. Our first taste of ice cold watermelon on a hot summer's day, the smell of cinnamon and apple as a pie bakes in Mom's kitchen...Memories. Born the son of a U.S. Diplomat, my first 17 years were a feast of exotic spices, herbs, fruits, vegetables and meats. As a logical progression of that upbringing, I am pleased to bring to you " Cuisine Mondiale" ("World Cuisine")...the taste of more than 25 different countries. Travel with us to Morocco, Mexico, Germany or the Caribbean and feast on these cuisines as you never have before. Using recipes collected over 30 years, (some thousands of years old) flavored with hand picked herbs and spices from indigenous tribes and markets from all over the world...we will re-create the smells, sights and flavors of your favorite country...or...let us lead you to a place you have never been. For the memories of a lifetime, choose the flavor, service and charm of Cuisine Mondiale for your special event and let us worry about the details..."
WE LOOK FORWARD TO SERVING YOU SOON !!! We strive to provide an environment where our clients can be at complete ease during their event. No detail is overlooked...We use the finest ingredients (organic wherever possible), provide a friendly, courteous and professional staff. We cater to our clients every need. We strive to have a minimal impact on our planet. We are a green company ! Two percent of our net profits will be donated to Heifer International annually, to help feed the world in a responsible manner. We have honey bee hives at Cuisine Mondiale, raise our own herbs and flower garnishes and use eggs fresh from our hen house. Only organic matter is used in raising our plants and no toxic fertilizers will ever be used on items we raise ourselves.